Ohayōgozaimasu! ♥ My name is Jan. ☺ I got a Bachelor’s Degree of Education, and I am also a Licensed English Teacher. I had a little experience in teaching high school students both public and private schools during my internship, and it already qualified me to teach and manage students. It’s an honor for me to speak and befriend with Japanese. I admire Japanese people for their politeness, patriotism, and hard-work. I confirm it when I visited Japan twice. So, I will work hard too to give you a quality teaching. There are many things to learn about the world.☺ And it helps increase our knowledge when we know how to understand and speak English (The Universal Language). Perfection is possibly achieved through a regular practice. Come and Join me! Let's do it together and Learn English as a Second Language. Teacher Jan got a Bachelor’s Degree of Education major in English. She is also a licensed teacher for High School students. She tried to work other jobs as a Sales Officer and an Insurance Underwriter. Her hobbies are watching movies and playing useful info videos on YouTube. She wants to go back in teaching and become an ESL teacher to share and apply her knowledge to other people. 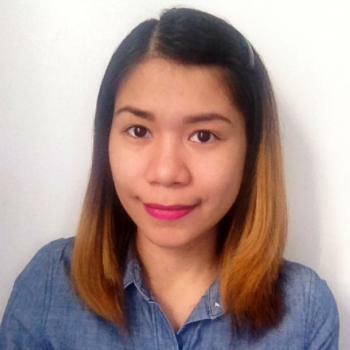 She is open-minded and cooperative to achieve quality learning for beginners and intermediate level students. side by side。時間がきてしまって途中で終わってしまいました。ごめんなさい。ありがとうございました。Thank you Jan sensei!I hope to take your lesson again.See you soon. I had a good time. Thank you for your time.